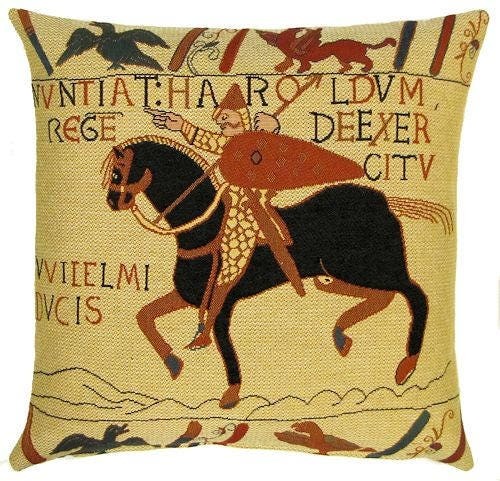 This Museum Collection gobelin cushion cover shows a fragment of the tapestry of Bayeux, ) which is an embroidered cloth nearly 70 metres (230 ft) long and 50 centimetres (20 in) tall. It depicts the events leading up to the Norman conquest of England concerning William, Duke of Normandy, and Harold, Earl of Wessex, later King of England, and culminating in the Battle of Hastings. Beautifully done pillow cover. My mother is going to love it! Thank you! This is a nice cover depicting a scene in the Bayeux Tapestry. The cover fits well and the fabric is good quality. One thing to improve it would be to add a stitching line around the edge of the cover, so the back side doesn't roll forward. This is a beautiful tapestry pillow. Just what I hoped it would be. Thank you! !